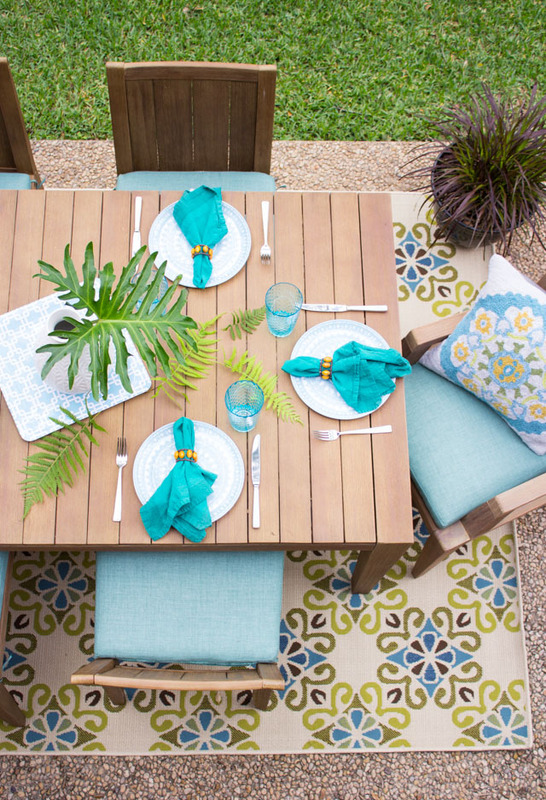 I’m so excited to be partnering with Home Decorators Collection for our backyard patio reveal! It’s quiet a dramatic change and one that has been a long time coming. The space has been more or less untouched since we moved in nearly 3 years ago – see the “before” at the bottom of the post! 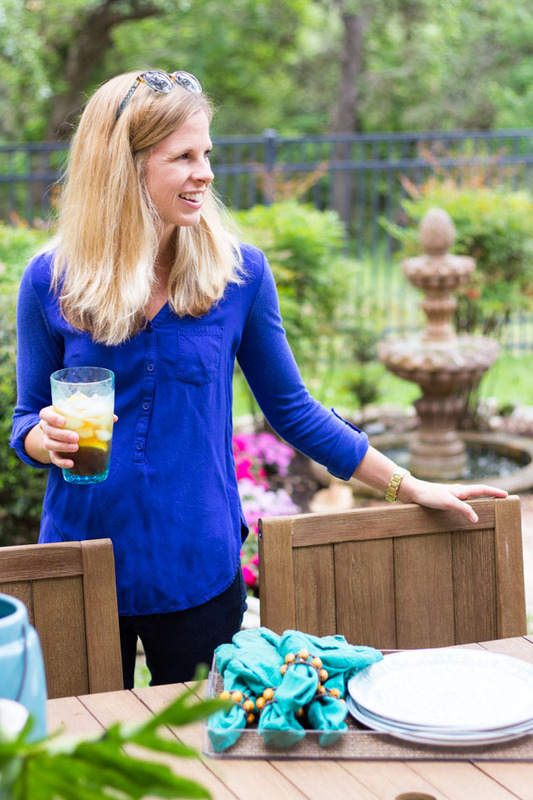 I’m sharing the 7 steps I took to transform our drab space into a comfortable and stylish outdoor dining area. I hope these easy patio decorating ideas will be helpful for you if your own outdoor space could use a revamp. 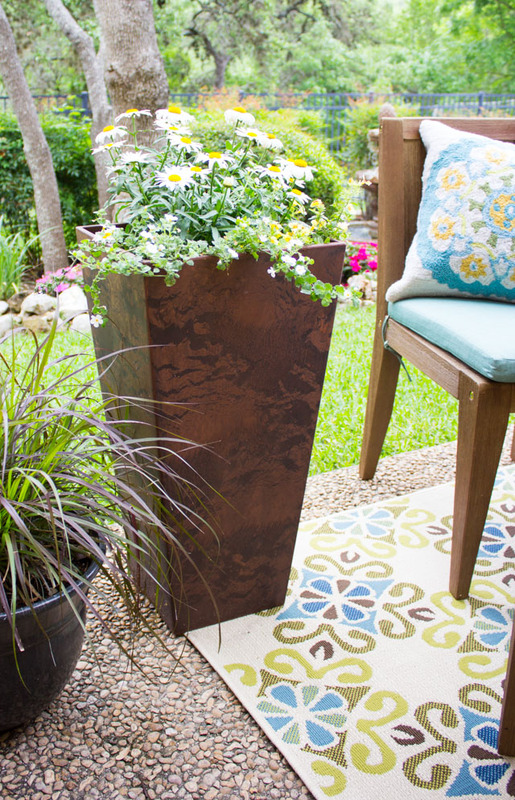 If there is one step you take to update your patio space, this should be it! 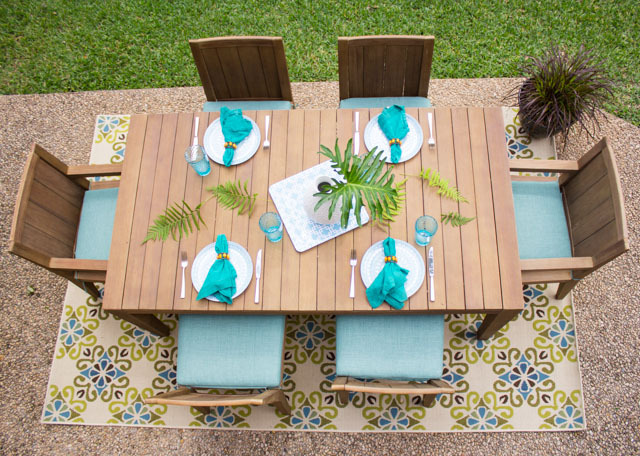 A lot of people often don’t consider using rugs outdoors, but a great rug has the power to instantly turn an outdoor slab of concrete or wood deck into a cozy room. It is one of my favorite decorating tricks! 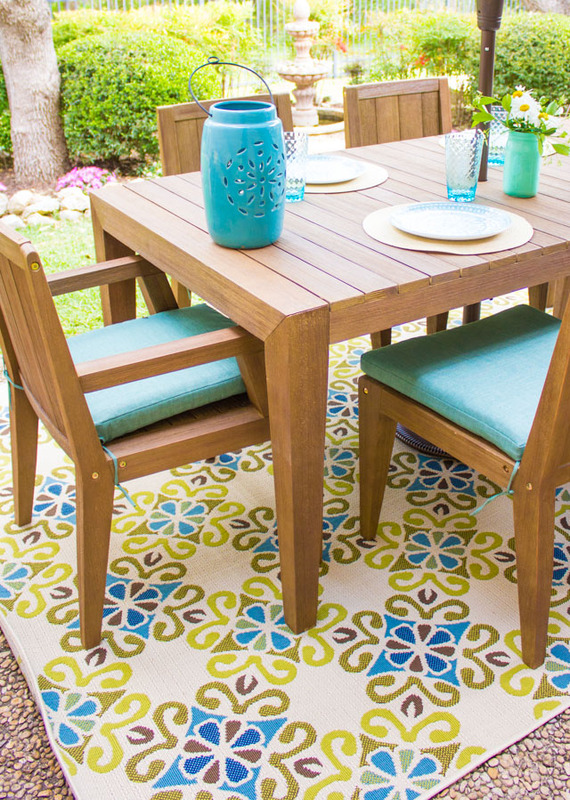 Our patio area was all very beige with pebble concrete and the beige exterior of our home, but adding this colorful Stargaze Area Rug from Home Decorators gave the space an instant dose of color. 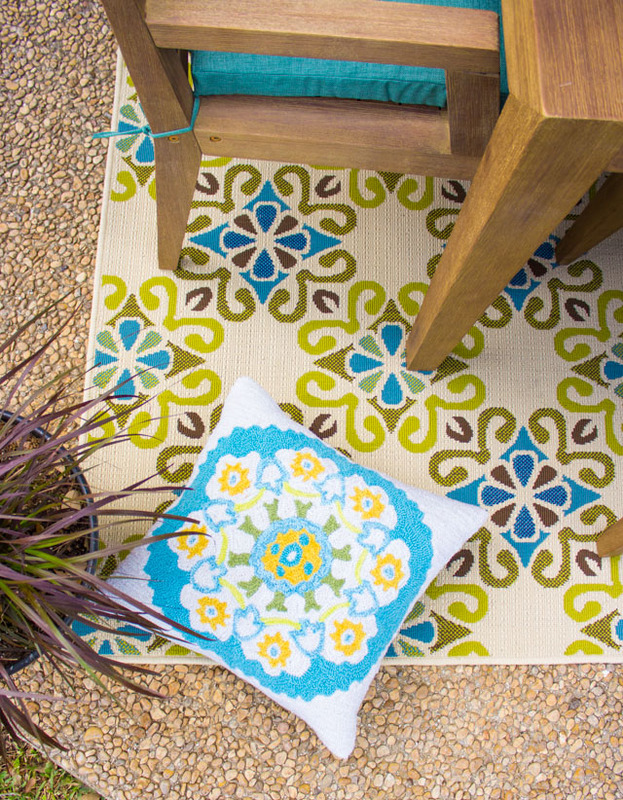 I recommend going a little bolder with your outdoor rugs than you would indoors – the more color and pattern, the better! 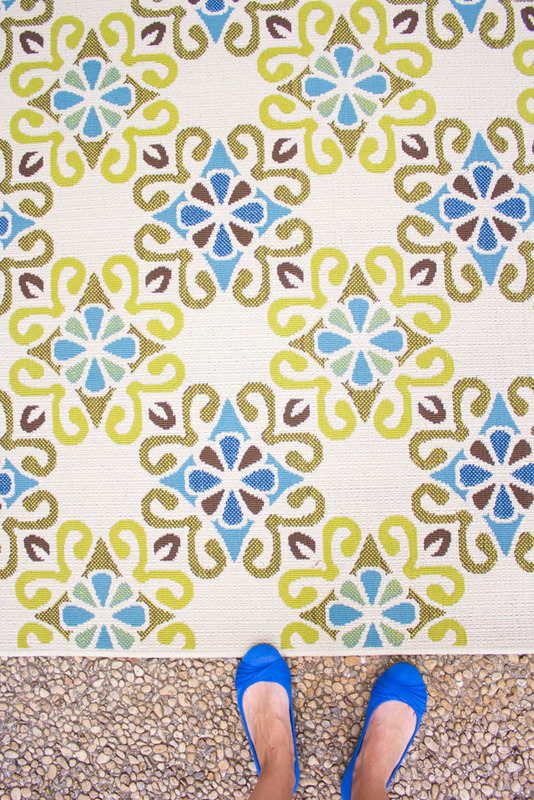 I loved the bright blue and green shades and the pretty geometric floral pattern of this Stargaze Area Rug. 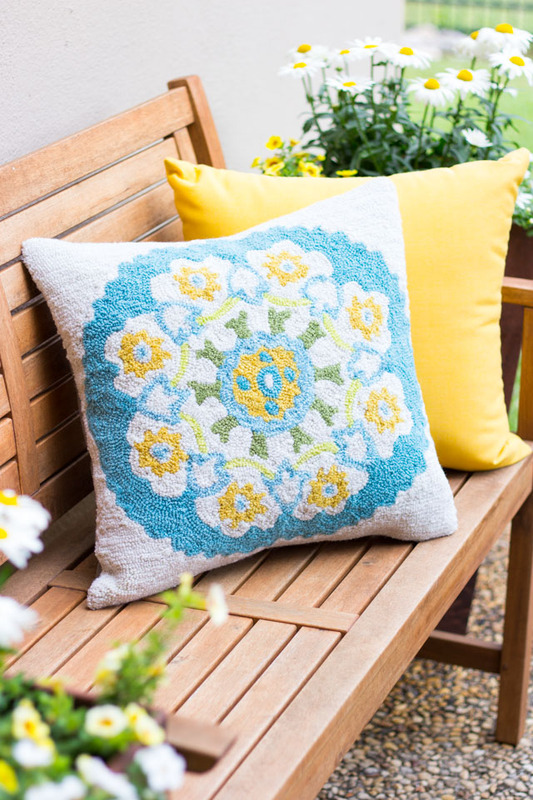 After I knew this rug was the one, I used it as the inspiration piece for all the other coordinating pieces for the patio like this pretty embroidered pillow. I recommend starting with the rug first, and then using that as the guide for the rest of your patio decor. 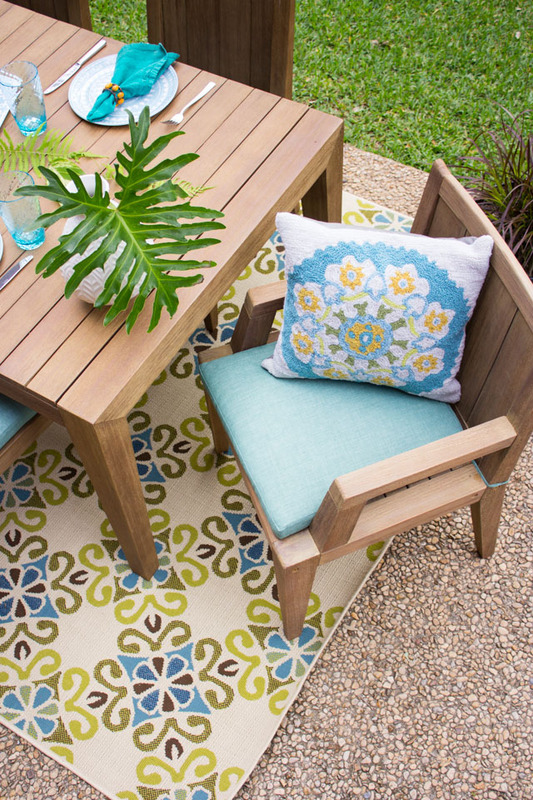 When choosing an outdoor rug, be sure to select one that is made to withstand the elements. This polypropylene rug is made to resist fading and mildew and can be cleaned off with a garden hose. I like adding an outdoor rug pad to help extend its life and allow it to dry more quickly after it rains. 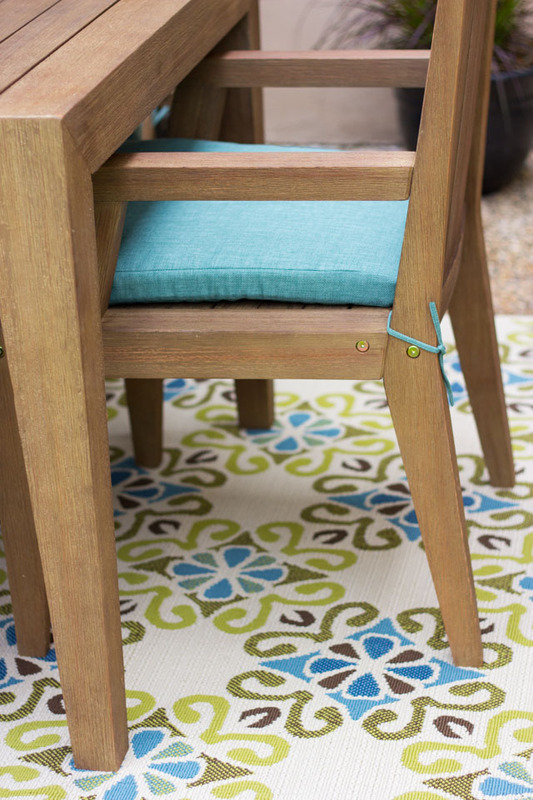 Keeping your outdoor rug under a covered patio will extend the life even further! 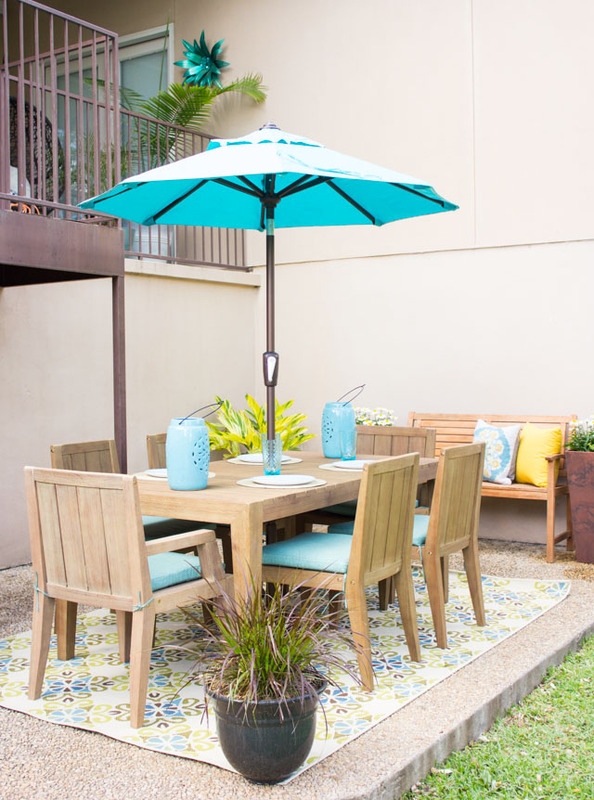 Dining al fresco is one of my favorite things to do so having a functional dining space for us was key. The picnic table we had previously did the job, but our new Bermuda Dining Set is much more inviting and comfortable for entertaining. 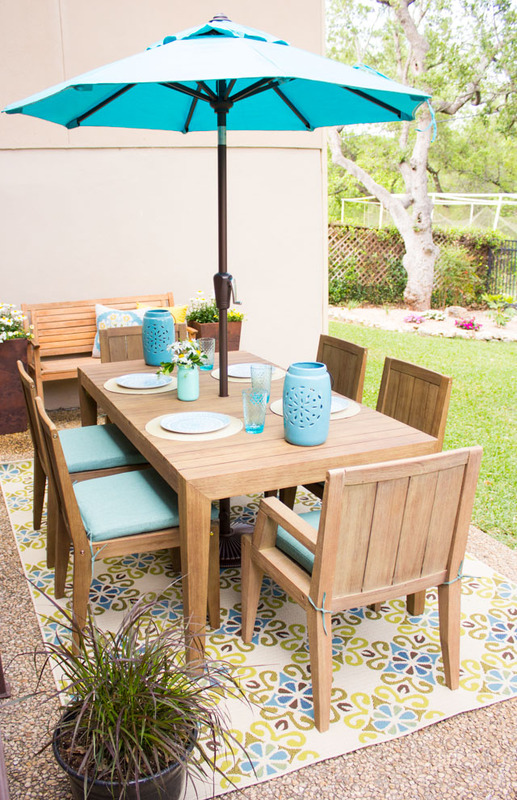 If you have a small patio space, a bistro table and two chairs is the perfect way to incorporate a dining area. This one comes in several fun colors! I want to be able to linger outside without my back hurting! The sturdy chairs that come with the Bermuda Dining Set are really comfortable thanks to their slanted backs and seat cushion. If you have the space, you can even incorporate a separate seating area with a couple rockers or cushioned chairs. Pillows are one of my favorite accent pieces to achieve an indoor feel, outdoors! There are so many gorgeous options to choose from like this hand-tufted Suzanie Outdoor pillow. It looks like an indoor pillow but it is built to withstand the elements! I paired it with a daffodil outdoor throw pillow to add another pop of bright color. 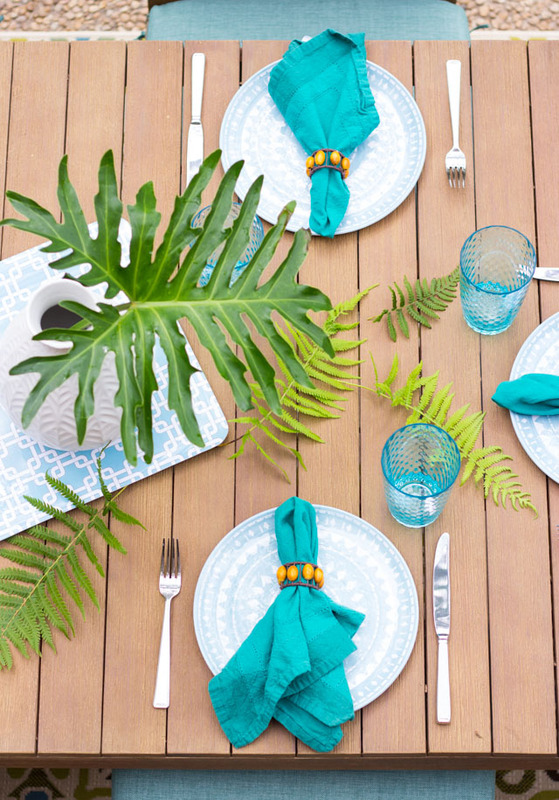 You can’t go wrong with lots of color on your patio – go bold! Other accents like lanterns, wall decor, and vases can make your outdoor space feel like another room in your home. 5. Don’t forget sun protection! 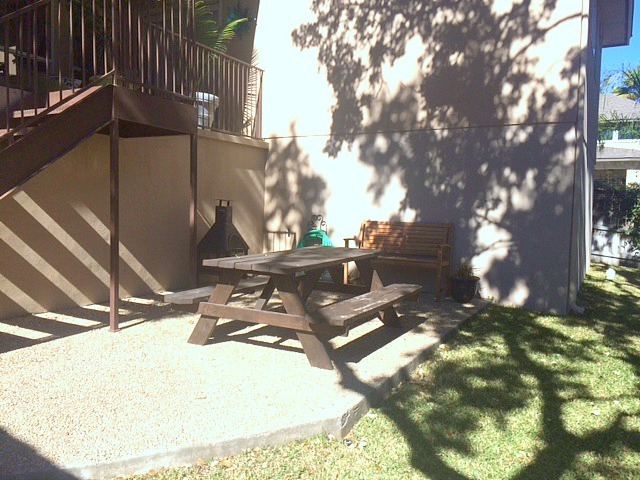 No one wants to sit out on the patio in the glaring summer sun – especially here in Texas! I have a feeling this auto-tilt umbrella will get a lot of use this summer. It fits nicely in the table, but can also be moved to other parts of the patio and stand alone with its umbrella stand if needed. 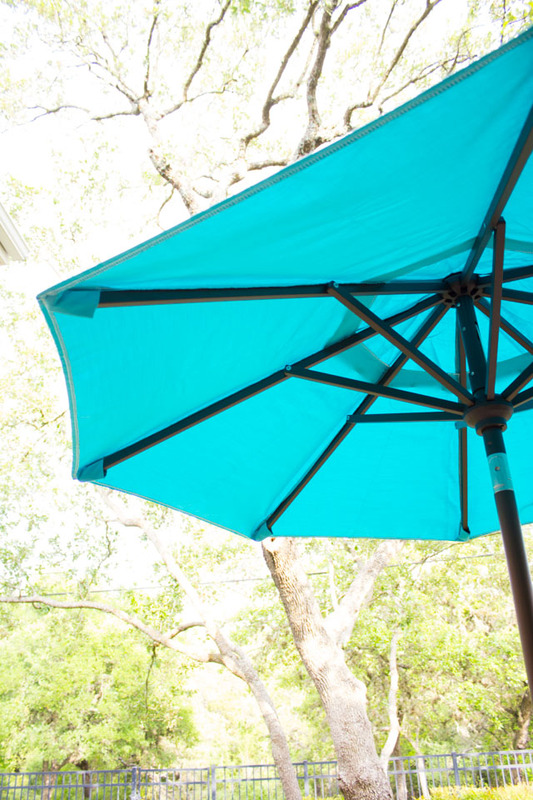 The umbrella is another opportunity to add a big dose of color to your space like this Aruba blue. A patio isn’t a patio without a few plants! Choose hardy plants that are easy to grow in your area and look for colors and textures that compliment your patio decor. Choosing a great pot is just as important as the plants themselves. I loved these tall planters. To fill it with flowers I followed the “thriller, filler, and spiller” rule – choose one tall “thriller” plant, one shorter filler plant, and one spiller plant that will trail over the side of the planter. This is a no-fail combo! 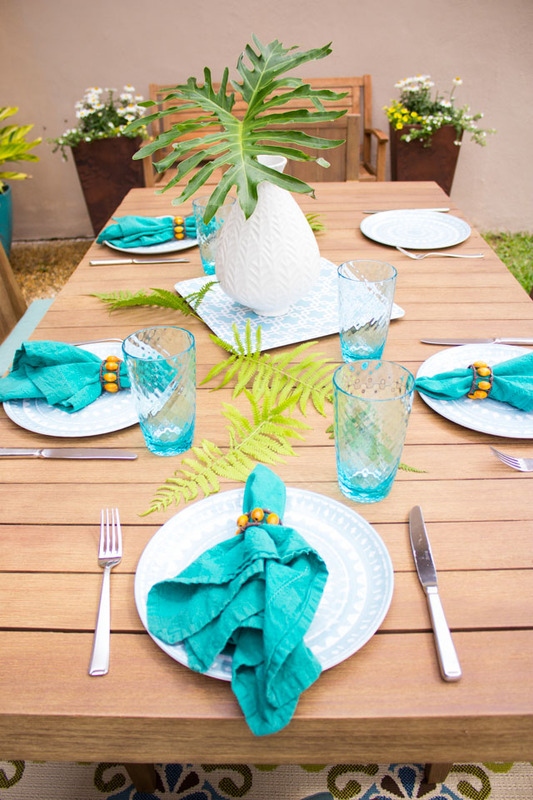 Setting the table to entertain some guests? Look to your backyard to incorporate some green. I cut these philodendron and fern leaves to make a last minute centerpiece for free! 7. Invite over a few friends and enjoy! 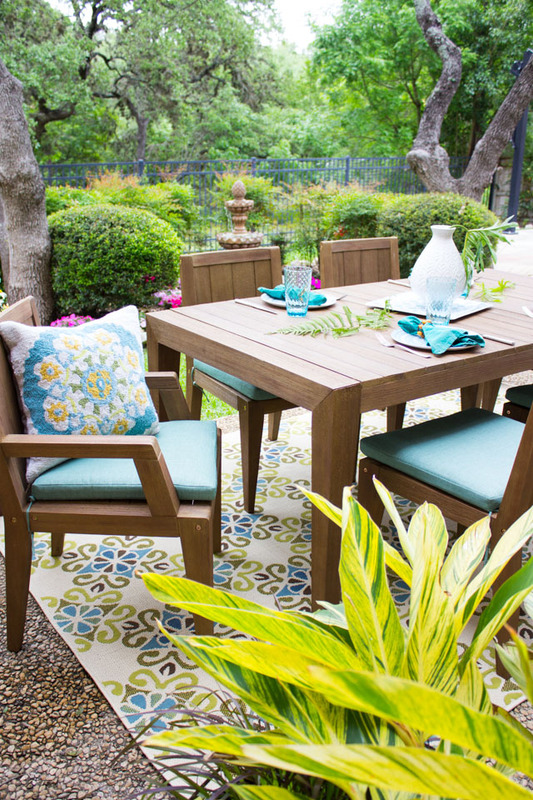 The best part of your new patio is having a space to enjoy with others. We had a few neighbors over last weekend to enjoy a beautiful sunny afternoon in the backyard and test out our new patio furniture. It was a big success! Now for the “before”…. quite a difference, right?! A big thanks to Home Decorators Collection for helping transform our patio just in time for summer! This post is sponsored by Home Decorators Collection.